I hope you had a great start to the week. I was a bit sleep deprived during the weekend so I was like in a dream all day. And it is so cold right now in Germany, you wouldn't believe when I say it snowed? I don't know what is wrong with weather really. I am also concerned about the birds who are back. I hope it gets better soon. I have been testing new skin care launches from Clarins, two of which I would like to share with you today, Clarins Multi-Active Jour and Multi-Active Nuit. In case you are located in Germany or Austria, there is also a give-away at the end of this post which you may like to enter. Clarins Multi-Active series are formulated for the first signs of aging and are recommended for those of us who are above 30. The line has a night (Multi-Active Nuit) and a day (Multi-Active Jour) cream. Each cream are available in different richness levels for your skin's needs from dry to mix skin. Night cream is available in two different formulation (normal to dry, normal to mixed) whereas day cream comes in three versions as well as with and without SPF. I usually select my night creams richer than the day creams. During the day if I use very rich creams, then my foundation sometimes moves. I have been using Clarins Multi-Active Jour, the one for dry skin and for the winter/spring time it worked for me. I tested Multi-Active Nuit in Normal-to-Dry skin formulation. I mix this one with some facial oil and I am happy with the results in the morning. Both of the creams feel very light weight on the skin, absorbed quickly and the effects last for a few hours. I took a photo of the ingredients if you would like to check. Final thoughts: All in all I love how easy they are to apply and how light weight these are. I especially enjoy the day cream under the foundation to keep the skin hydrated throughout the day. I like the night cream mixed with facial oils since it doesn't separate and mixes well. Recommended for those who like it light and effective. 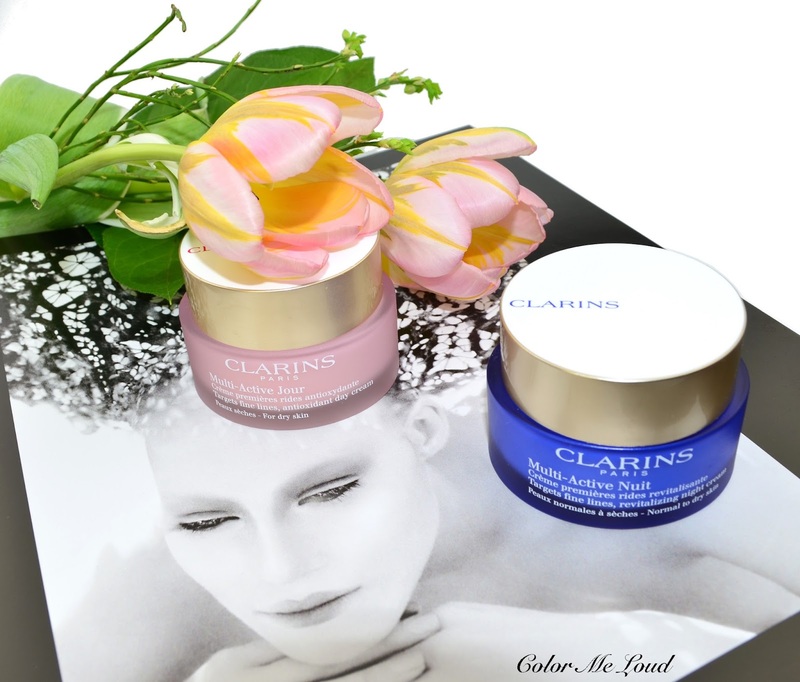 Thanks to Clarins DE for providing two sets for Mother's Day. The giveaway is open for Germany & Austria. The sets will be sent via Clarins DE. Each winner wins one set. 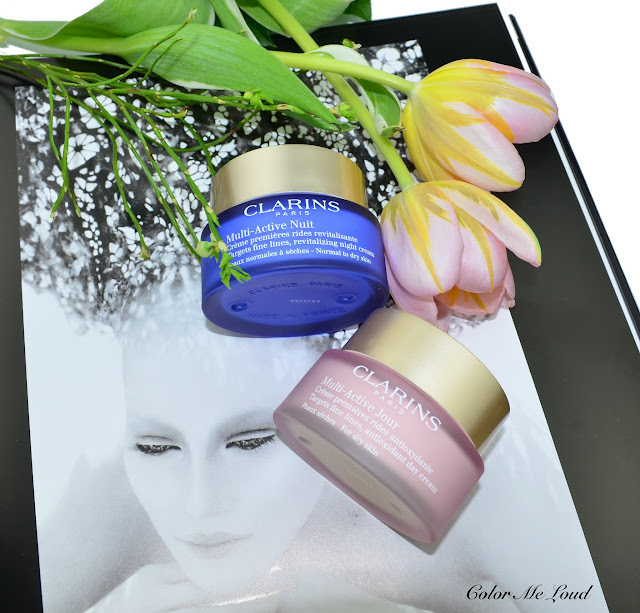 The products for the giveaway are provided by Clarins DE. I am not paid for this review/giveaway. I am currently using Clinique Moisture Surge! I tend to do the opposite: richer cream/oil for the day for added protection. I got the night cream as a gift, will try it soon. I remember buying this line when I worked at the airport, spending all that hard earn cash in duty free (with a generous discount, of course). Ps.1 I really enjoy the Clinique eyecream! Ps.2 I do like and anjoy the honey line by Guerlain (serum and oil) but not sure if I can justify the price tag. Aw, no Switzerland? :-( My mom would be all over these. Good luck to everyone who is entering! I don't have one that I use consistently that I love. Looking for that perfect one. Awww.... i used to LOVE the multi-active day cream!! I believe this was the very first Clarins skincare I've ever tried back about a decade or more ago. If only your giveaway was international! I've been using Boscia. 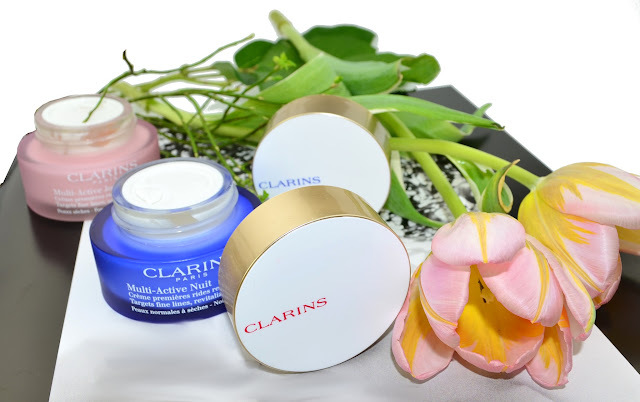 I've never tried a Clarins moisturizer, but I'd be so excited to, because everything else Clarins I've tried has been amazing!